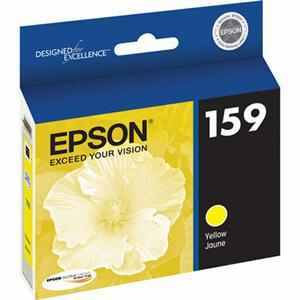 Genuine OEM Epson Ink Cartridge, Yellow, 400 page yield. Epson part number: T159420, 159. Genuine OEM Epson Ink Cartridge, Cyan, 400 page yield. Epson part number: T159220, 159. Genuine OEM Epson Ink Cartridge, Magenta, 400 page yield. Epson part number: T159320, 159. Genuine OEM Epson Ink Cartridge, Red, 400 page yield. Epson part number: T159720, 159. Genuine OEM Epson Ink Cartridge, Orange, 400 page yield. Epson part number: T159920, 159. Genuine OEM Epson Ink Cartridge, Photo Black, 400 page yield. Epson part number: T159120, 159. Genuine OEM Epson Ink Cartridge, Matte Black, 400 page yield. Epson part number: T159820, 159. Genuine OEM Epson Ink Cartridge Multipack, 400 page yield. Multipack includes: two Gloss Optimizer ink cartridges. Epson part number: T159020, 159.